Hi friends! 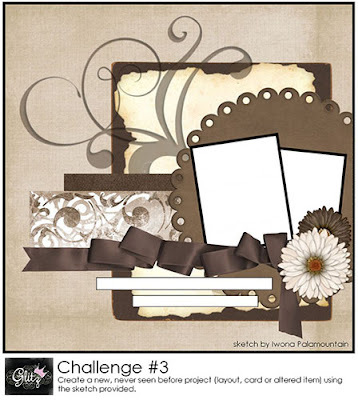 This is a layout I created for the June 2011 'Get Your Glitz On' Challenge using their Laced with Grace Collection. The photo is of my children a few years ago. Although they bicker at times, they truly do love each other and look out for one another. I love the close relationship they have, and I hope it continues as they grow older. This large flower is hand-made. You can find the tutorial HERE. This beautiful chipboard element is made by The Dusty Attic. For a simple tutorial on how to achieve this effect, click HERE. The background was masked using a Prima mask and Forest Moss Distress Ink. 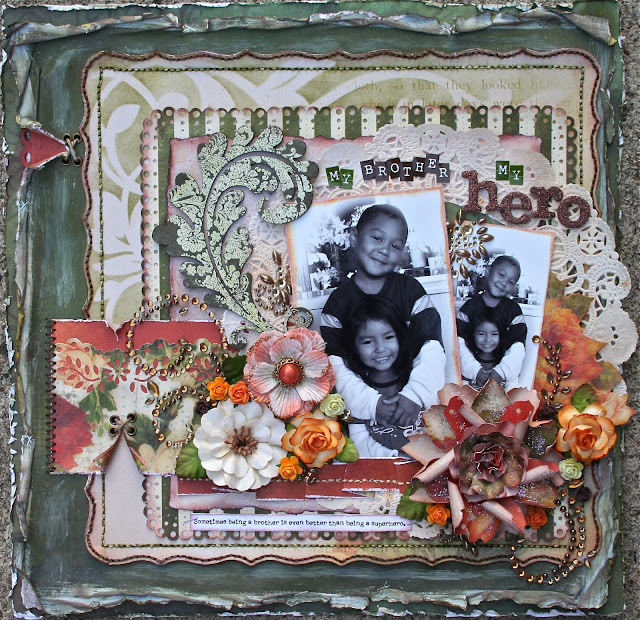 The title was made using alphabet stickers by Glitz and American Crafts. This is so very sweet. You know I have a soft spot for siblings because I'm an only child & have always wished for an older brother. So whenever I see pages based on siblings...I tend to get nostalgic. This as usual...is beautiful. The design, the textures, the stitching...it's got your mark all over it--but the picture is hands down the most precious thing on this page. Love it! Sweet children. Great distressing, embossed chippie, and elements. oh wow! this is so beautiful, not just for the brilliant scrapping but for the lovely quote and photo.. love your creations..
All the Layers, texture & that handstitching..... Just Amazing!!! & what cute kids your have!!!!! Oh my goodness, Natasha!! This layout is just so lovely...I feel like I could stare at it for hours and find something new constantly!! I just love all the amazing layers and embellishments!! Thanks for playing in the "Get Your Glitz On" sketch challenge!! I KNOW you spent hours on that hand stitching...cause I've done it before, too! This page is just stunning!!!!! Thanks for joining the monthly Glitz challenge!